Maybe wannabe candidate for the Sixth Congressional District, Jason Crow, doesn’t read the newspaper. That’s ok. That’s why we’re here to help. Crow, in a strange political gaffe, is hosting a roundtable to talk about gun violence in schools. Laudable. 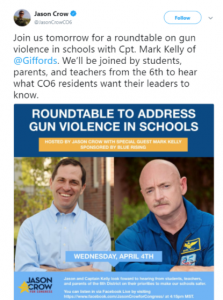 And he’s invited Gabby Giffords’ husband Mark Kelly to be a key speaker. Laughable. It’s unclear what insight Kelly can offer about gun violence at school or the follies in gun purchases since he proved that some safeguards existed, but why let a little thing like credibility stand in the way of a good narrative?